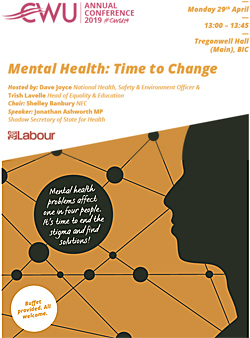 CWU Conference 2019 will see Labour front bench spokesperson and Shadow Health Minister Jon Ashworth feature as guest keynote speaker on Mental Health at the Union’s first joint Health & Safety Dept & Equality & Training Dept's Fringe Meeting at lunch time on Monday 29th April 2019. All Conference delegates and visitors are welcome to the meeting themed "Mental Health: Time To Change"
The Annual General CWU Conference Health & Safety Fringe meeting was always the most well attended of all fringe meetings held during the Union’s annul conference week, traditionally held during the Monday lunch time period. This year, given the urgency with which the Union sees mental health at work and in the community as a major issue facing the Trade Union movement, following the emotional debates on the issues at Conference 2018; the CWU Health & Safety Department and the newly formed Equality and Training Department were both going to headline mental health in their respective fringe meetings. In order to maximise the opportunity for those delegates working in both fields; to not have to choose between the two fringe meetings as happened from time to time; running a joint fringe meeting where mental health is the subject matter made perfect sense. More importantly with the CWU recognising that supporting its members mental health at work concerns both departments, the logic of having a joint fringe meeting involving both departments with such a key speaker as Jonathon Ashworth; is a logical and positive move. We're expecting a big attendance for a meeting on what is now a subject which is the centre of attention for trade unions and society. Government commitments are welcome but it's time to see improvement. Prevention is vital but more investment is needed to improve the nation's mental health. Jonathan will set out Labour's vision on how that should be done." Jon Ashworth is the Labour and Co-operative Party politician who has served as the Member of Parliament for Leicester South since 2011, and is the current Shadow Secretary of State for Health and Social Care. 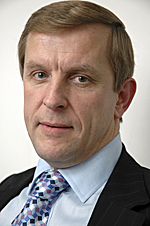 "This crisis also extends to mental health provision, which for too long has remained the Cinderella service of the NHS – undervalued and underfunded. That’s why Labour will substantially increase spending on mental health, and deliver a world-class mental health service."